The Glen Ames Senior Public School's robotics team members are Grace, Robin, Finn, Sasha, Shane, Ben, Ethan, Adam, Tommy and Thomas. Teachers are Ms. Buckley and Mr. Martin (who is not in this photo). 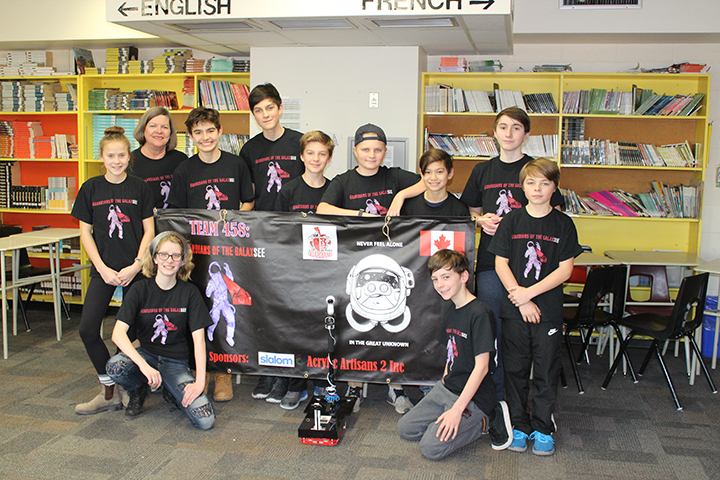 For the ninth year in a row, students at Glen Ames Senior Public School in the Beach are heading to the Ontario robotics championships. The team of 10 Grade 8 students is hoping to build on past successes which has seen Glen Ames not only earn provincial and national honours, but also qualify for international competition in California at the FIRST (For Inspiration and Recognition of Science and Technology) Lego League championships in the past two years. The FFL (FIRST Lego League) is an international alliance between Lego and FIRST. It challenges teams of students from around the world to come up with solutions to real world problems using robotics and technology. The teams taking part must design, build and program their robot using Lego Mindstorms technology and compete on a table-top playing field. The challenge for the 2018-19 FLL season was Into Orbit, and it asked students to think like engineers and scientists facing an issue in outer space that needed a solution. This year’s Glen Ames team has given itself the name Guardians of the Galaxsee, and the project they have taken on is to help astronauts deal with loneliness in space. The Guardians’ project is called Home Away From Home and it uses a robot with a 360-degree camera that records video memories in the astronaut’s home which can be viewed in virtual reality. The camera on the robot brings images of familiar faces and places right to the astronaut. Supporting astronauts’ mental wellbeing, as opposed to just their physical health, is becoming increasingly important for agencies such as NASA (National Aeronautics and Space Administration) as space missions are becoming longer. “NASA has focussed on physical health, but mental health can’t always be seen and it has a huge impact. If astronauts don’t have the right state of mind to complete the mission, things could go wrong” explained Grace, one of the co-captains of the Guardians. The Guardians’ team members are excited about the upcoming provincial championships on Jan. 12 at Durham College in Oshawa, and are putting in lots of hours in advance of the competition. The students are in about 7:30 a.m. every day, work on the project during their lunch hour and after school as well. The FLL puts an emphasis not only the technology developed by the students, but how well they work together as a team to solve problems and how well they present their project. These are FLL’s core values, explained Guardians co-captain Finn, and it was a key part of how the Glen Ames students came up their 360 Home Away From Home concept. “First we had a team meeting and did research and presented video power points, and then we all voted and commented on everybody’s ideas and that’s how we came up with 360 Home Away From Home,” he said. The team is led by teachers Luke Martin and Barb Buckley. In past years, Glen Ames teams have enjoyed huge success. Last year, the team travelled to Legoland in California and earned a perfect project score for their work on reducing lead in drinking water. They did the same the year before that as well. And the success has led to the team being enormously popular, and tryouts are necessary to be selected to the squad. The members of the Guardians do admit to being aware of past successes of teams that came before them. “There’s a little bit of pressure,” said Finn.